How to create a Lesson using the Timeline Component? The Timeline content type allows you to place a sequence of events in a chronological order. You can drag the scale to go to a specified time and the content will change automatically according to the time selected. You can use this component whenever you want to explain the history of any person or some important things. Since the history is explained in an interactive style, the users can easily relate to it. The top side of the page may have a link to any media including Twitter, YouTube, Flickr, Vimeo, Google Maps and SoundCloud items. This is the description area for each slide in the timeline. 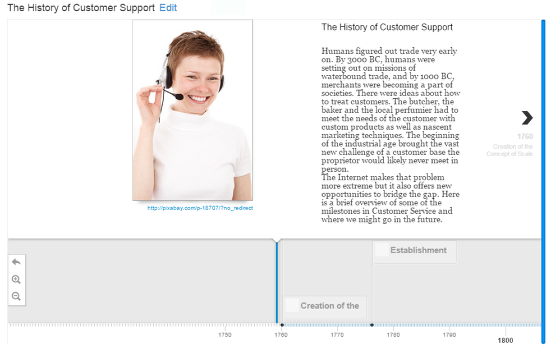 At the bottom of the page, there is a predefined scale showing the timeline for the history explained in this lesson. The user can navigate through the timeline by clicking the navigation button on the left and right sides of the description area. They can also drag the timeline scale to go to a specific time in the history and click on any title found in the scale. The description area on the top will change itself to show the contents for the selected title. User can return to the home page of the timeline by clicking the Return to Title button on the scale. The Body Text field can have bulleted points, hyperlinks etc. User can zoom into the scale to find the time entries more precisely. You can set the default zoom value for the scale. You can add a media URL link to the description part of the page. It could be a link to Twitter, YouTube, Flickr, Vimeo, Google Maps and SoundCloud. These resources are called assets. Credits to the above external resources are visible to the users. You can add thumbnail images to these assets optionally. You can add as many timestamps as you want to the scale. Click on the More elements  icon then click on the Timeline  component icon as shown in the above image. You will see a screen similar to the image shown below. Click the arrow button shown in the above screen. You will see the below screen. Add a main timeline heading by typing it in the Headline  field. 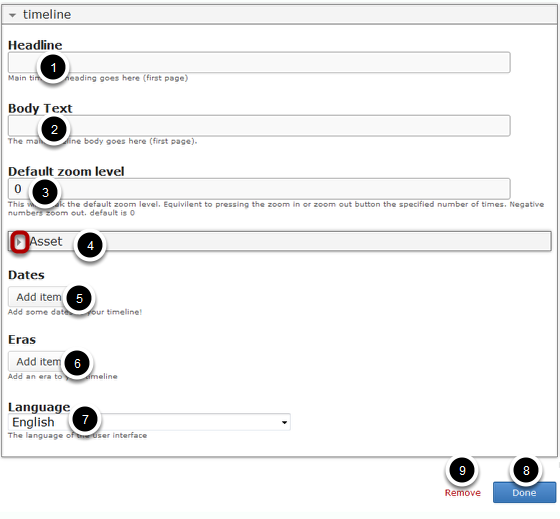 Add some text for the timeline home page by typing it in the Body Text  field. Set the default zoom level by typing it in the Default zoom level  field. Add a media URL link and update its details by clicking the arrow button shown with the Asset  title. Add dates to the timeline by clicking Add item  button under Dates title. Add an era to your timeline by clicking the Add item  button under Eras title. Choose the user interface language from the Language  drop down option. Type the main timeline heading in the Headline field as shown in the above image. This field is mandatory. This title will be shown on the home page of the timeline. You can add some introduction text in the Body Text field as shown in the above image. You can also change the format of the text, add and remove hyperlinks and insert horizontal lines between the contents. This field is not mandatory. Type the zoom level value in the Default zoom level field as shown in the above image. This will tweak the default zoom level. It is equivalent to pressing the zoom in or zoom out button the specified number of times. Negative numbers zoom out. The default value is 0. You can update the assets on the home page by clicking the arrow button with Asset title as shown in the above image. You will see the below screen. Add a link to the media in the Media  field which will appear on this timeline's home page. It could be Twitter, YouTube, Flickr, Vimeo, Google Maps and SoundCloud item. Update credit details of the uploaded item in the Credits  field. Add a caption description in the Caption  field. You can start adding dates to your timeline by clicking the Add item button under the Dates title. You will see the below screen. Enter the start date for the date entry in the Start date  and end date in the End date  fields. Add a headline for the date entry in the Headline  field. Update description text in the Body text  field. Enter tags or categories under Tags  field. 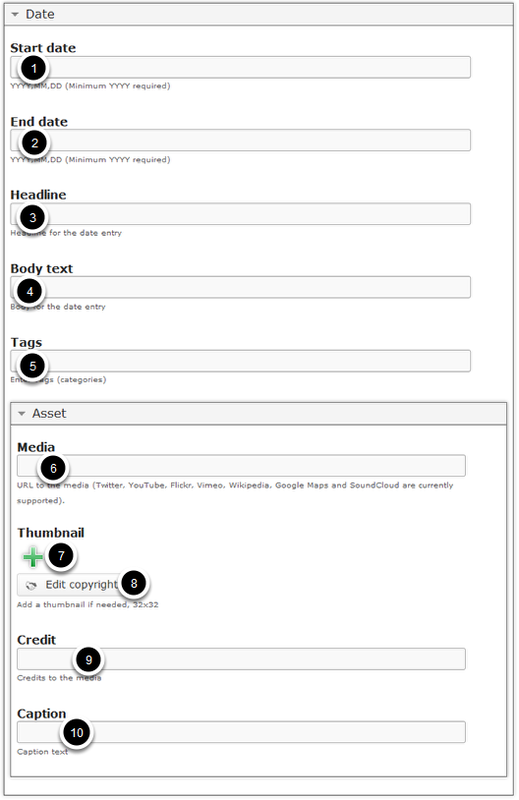 Enter the medial link in the Media  field under Asset title. Add a thumbnail to the media if needed by pressing the ‘+’ field Thumbnail  title. Update the thumbnail image’s copyright details by clicking the Edit copyright  button. Enter any credit details for the linked media in the Credit  field. Add caption text for the media in Caption  field. Type the start date for the date entry in YYYY,MM,DD format in the Start date field under the Dates title. This field is mandatory. An example date is: 2015,01,01. You don't have to enter the full date. But, you should enter a year at least, just like the one shown above. Type the end date for the date entry in YYYY,MM,DD format in the End date field. This field is not mandatory. You can enter the start date as the end date as well. Type the headline for the date entry in the Headline field as shown in the above image. This field is mandatory. 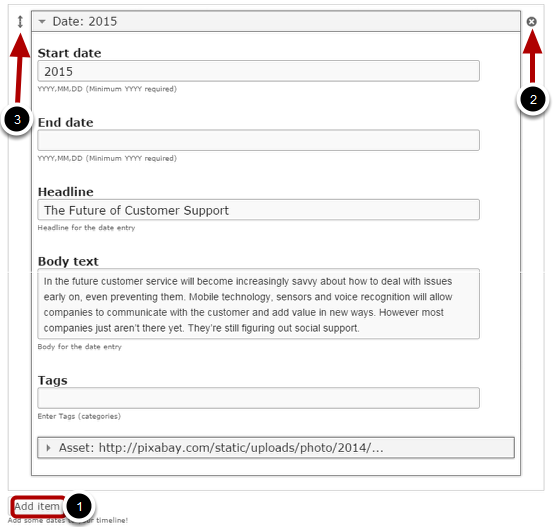 You can add contents to the description part of the date entry in the Body Text field as shown in the above image. You can also change the format of the text, add and remove hyperlinks and insert horizontal lines between the contents. Type the tag or categories for the date entry in the Tags field. This field is not mandatory. You can add and update the Assets for this date entry by clicking the arrow button shown in the above image. Then follow the below steps. Add a link to the media in the Media field which will appear for this specific time entry on the description part on the top of the page. It could be Twitter, YouTube, Flickr, Vimeo, Google Maps and SoundCloud item. You can upload a thumbnail image for the asset by clicking the '+' icon under Thumbnail  title. It will be displayed in 32x32 pixels size. Optionally, you can update the copyright details of the uploaded image by clicking the Edit copyright  button shown above. You can update the linked media's credit details in the Credit field shown above. You can add a caption text to the media in the Caption field shown above. 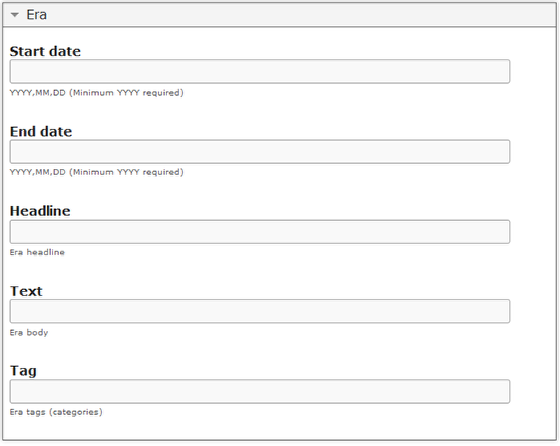 If you want to add another date entry, click the Add item  button as shown in the below image. Another date entry will be added after you've clicked the Add item button. You can remove any date entry by clicking the X  button on the top right corner of the date window. You can also change the order of the date entry by dragging the Double Headed Arrow  button on the top left corner of the date window. Similarly, you can add as many date entries as you want. You can add some Eras (a long and distinct period of history) as events to your timeline by clicking the Add item button under the Eras title. You will see the below screen. You can update the details about this specific era in the above screen just like you did for the date entries. In our case, we leave it blank. You can set the Language of the user interface by choosing from the Language drop down option. By default, it is set to English. You can add any bumber of date events in a page using this component.